KFC showcases in a new ad The Gravy Supreme, the piece of prototype pizza perfection created in partnership with Pizza Hut for the National Pizza Day (celebrated on February 9). 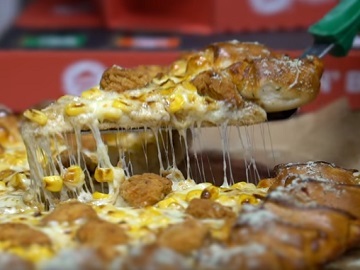 The spot shows the new creation and each of its ingredients, namely a Pizza Hut base with a cheesy bites crust, KFC gravy (instead of tomato sauce), popcorn chicken, sweet corn, and mozzarella cheese. The Gravy Supreme is currently not available to the public, being still subject to tests by Pizza Hut Delivery and KFC’s chief innovators. The chances to come to restaurants depend on the demand, the two companies revealing that, if the demand for the pizza is high enough, then the Gravy Supreme could hit stores across the nation next year.